We want to make it as easy as possible to work with financial data, and today, we're thrilled to share Link iOS, a native iOS SDK that makes connecting with user bank accounts even better on mobile. 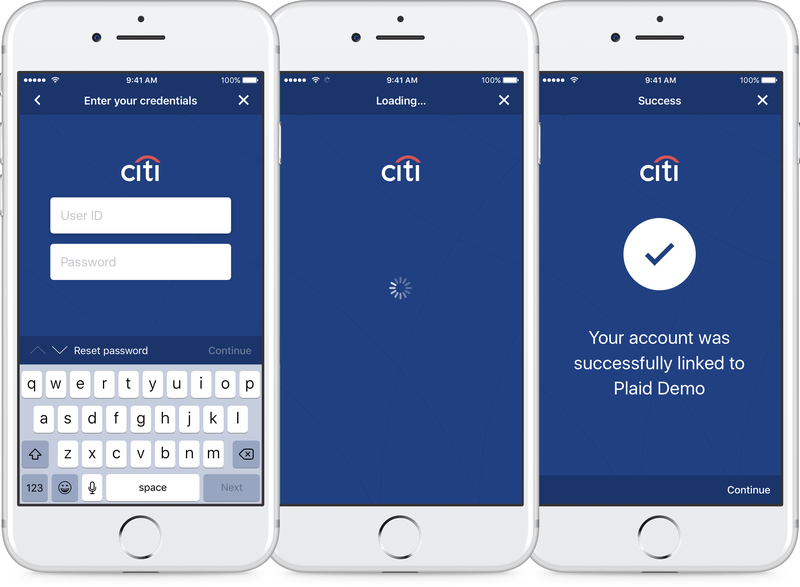 We launched Link in 2015 to help developers focus on building great applications—not on the intricacies of connecting with banks. With just a few lines of code, Link makes it possible to connect with the thousands of financial institutions we support, making it the best way to integrate with Plaid and interact with financial data. We wrote LinkKit with modern iOS applications in mind. It can be integrated into Objective-C and Swift applications as an embeddable framework (so it requires at least iOS 8.0). It fully supports VoiceOver, which also helps to make Plaid Link accessible to a wider audience. the Plaid product you’d like to add, and the Plaid environment you’re working in. linkConfiguration = [[PLKConfiguration alloc] initWithKey:@"<#YOUR_PLAID_PUBLIC_KEY#>"
Adopt the PLKPlaidLinkViewDelegate protocol and implement the following delegate methods, which will be called when Plaid Link iOS finishes. Note that you’ll want to dismiss the PLKPlaidLinkViewController and account for the exit or errors that might come up. You can integrate Link iOS into your app today! Head to our docs to get started, or jump right to our example Swift and Objective-C integrations. As always, let us know what you think!